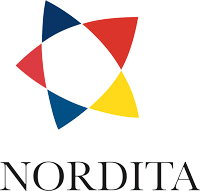 The organic materials database is an open access electronic structure database for 3-dimensional organic crystals, developed and hosted at the Nordic Institute for Theoretical Physics – Nordita. It provides tools for search queries based on data-mining and machine learning techniques. The universal features provided on our web interface facilitate the design of novel functional organic materials with a wide-range of applications. Large datasets of ab initio calculations enabled the pioneering studies of machine learning applied to quantum-chemical systems. For example, the popular QM9 dataset of small organic molecules and their properties can now be modelled by machine learning with chemical accuracy. However, a more challenging dataset of large organic crystal structures is not yet available. Therefore, we present a new consistent dataset of 12,500 crystal structures and their corresponding DFT band gap, freely available at https://omdb.diracmaterials.org/dataset. In this paper, we also evaluate the performance of two recent machine learning models on this new dataset: Kernel Ridge Regression with the Smooth Overlap of Atomic Positions (SOAP) and the deep learning model SchNet. Bart Olsthoorn, R. Matthias Geilhufe, Stanislav S. Borysov, Alexander V. Balatsky arXiv preprint arXiv:1810.12814 (2018). Dark Matter particles are commonly assumed to be weakly interacting massive particles (WIMPs) with a mass in the GeV to TeV range. However, recent interest has shifted towards lighter WIMPs, which are more difficult to probe experimentally. WIMP detection would require the use of small gap materials in sensors. We propose the use of informatics tools to rapidly assay materials band structures to search for small gap semiconductors and semimetals. 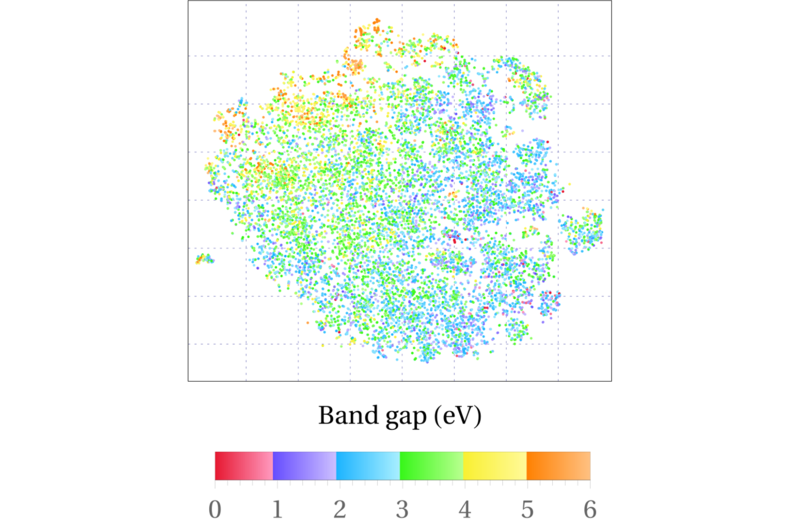 Using recent estimates of the WIMP mass, we identify the relevant target space towards small band gap materials (100-10 meV). We use a large dataset search to identify candidate materials, rather than focusing on a few preselected compounds. 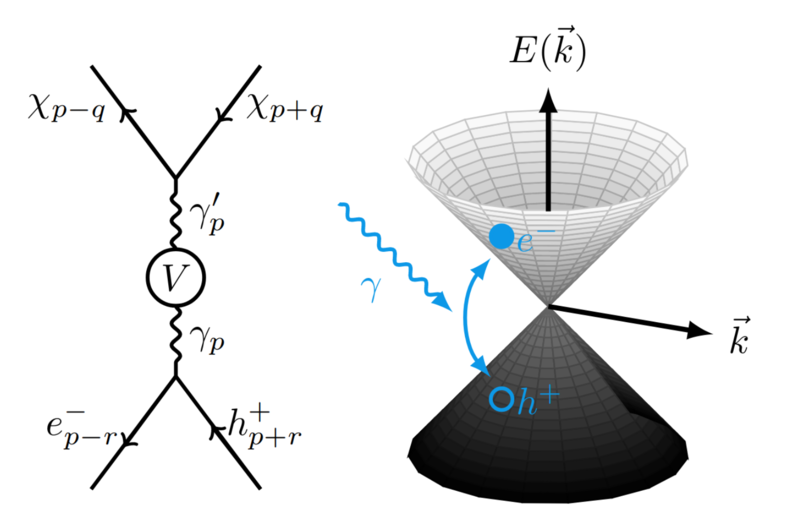 Dirac Materials, a class of small- or zero-gap materials, emerge as natural candidates for sensors for Dark Matter detection. As a specific example of the proposed search strategy, we use the Organic Materials Database to identify few organic candidates for sensors: the narrow band gap semiconductors BNQ-TTF and DEBTTT with gaps of 40 and 38 meV, and the Dirac-line semimetal (BEDT-TTF)⋅B which exhibits a tiny gap of ≈ 50 meV when spin-orbit coupling is included. We outline a novel approach to search for sensor materials where a rapid assay of materials using informatics tools yields more candidates and thus provides a useful tool to identify sensor materials for Dark Matter detection. R. Matthias Geilhufe, Bart Olsthoorn, Alfredo Ferella, Timo Koski, Felix Kahlhoefer, Jan Conrad, Alexander V. Balatsky, Phys. Status Solidi RRL, 12: 1800293 (2018). Organic charge transfer salts, especially quasi two-dimensional (BEDT-TTF) based crystals, have generated great interest over the past few decades. Depending on the structural phase, the acceptor molecules, and other factors, these can be associated with a rich variety of physical phenomena such as charge ordering, metal-insulator transitions, unconventional superconductivity, antiferromagnetism and spin liquids. 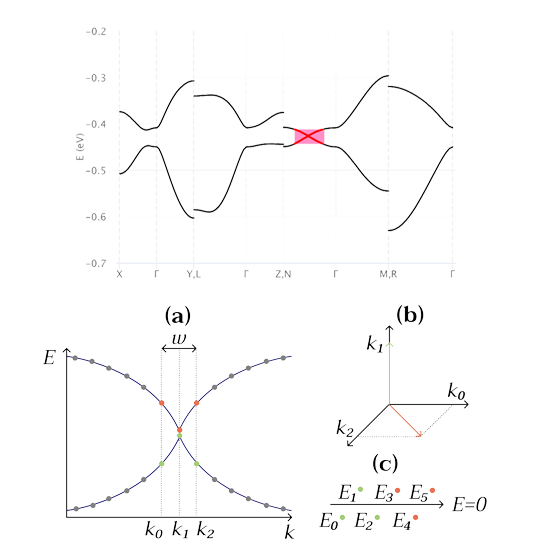 Especially α-(BEDT-TTF)2I3 has been shown to exhibit a semiconductor-semimetal phase transition under applying high pressure, where the low-energy excitations in the semimetallic phase behave as massless Dirac fermions leading to unique transport properties. In a series of papers it has been shown that under a hypothetical substitution of iodine with the halogens bromine, chlorine and fluorine the unit cell size tremendously decreases introducing topolgical nodes and semimetallicity due to chemical strain. Currently the OMDB stores hundreds of electronic structures of charge transfer salts and therefore represents a powerful tool for identifying such novel phases of matter. B. Commeau, R. M. Geilhufe, G. W. Fernando, A. V. Balatsky, Physical Review B 96.12 (2017): 125135. Our proposed project is about predicting novel stable crystal structures using the recent advances in generative modeling from the machine learning field, bypassing computationally demanding first-principles optimization calculations. 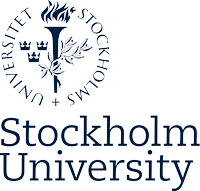 Particular focus is made on prediction of organic crystals with metallic and semiconducting properties. Finding such materials in the organic space, which is mainly populated by wide-gap insulators, is a highly non-trivial task. At the same time, these functional materials offer promising technological applications in electronics and offer a basis for environmentally friendly technologies. The electronic structure data from the OMDB will be available for training. The study of topological materials has tremendously stimulated condensed matter research. 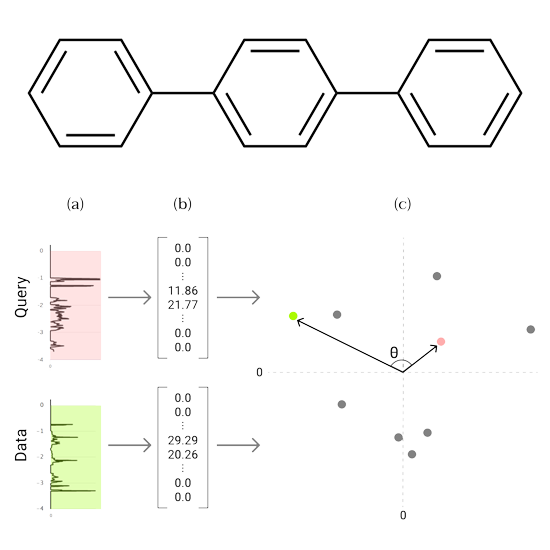 Based on a data-mining exercise within the Organic Materials Database OMDB it was possible to identify the nature of topological band crossings based on the underlying crystalline symmetry. 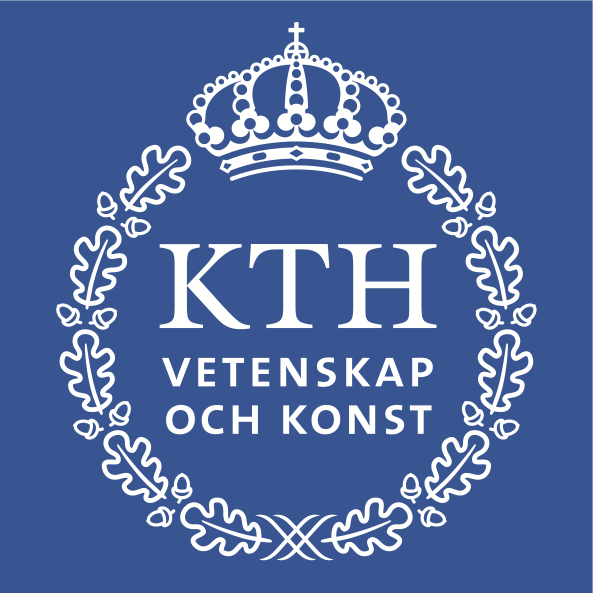 In a collaboration of researchers from Nordita, the Royal Institute of Technology KTH and Uppsala University pattern matching was applied to identify examples of topological crossings in materials with space group 14 and 19 and to explain their stability based on topological invariants. 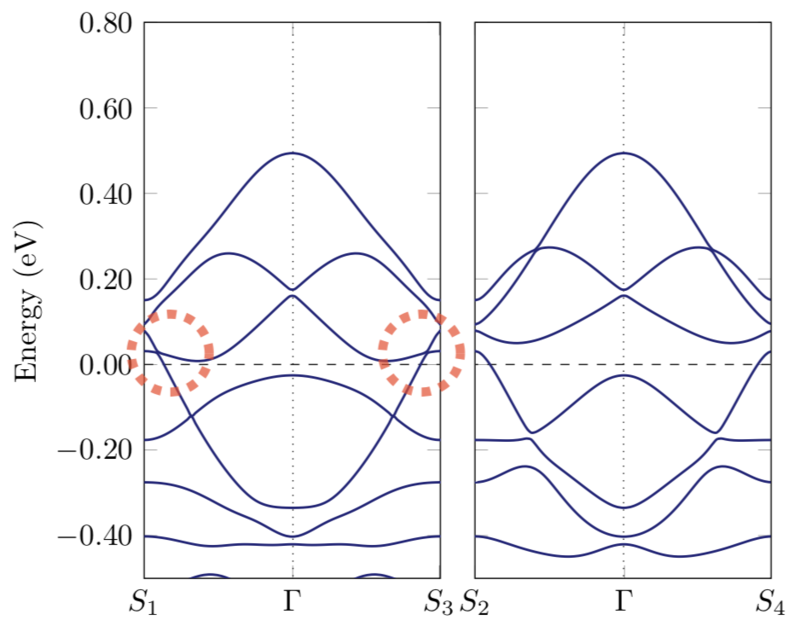 It could be shown that such topological invariants can be deduced from the irreducible representations associated to the electronic band structure. R. M. Geilhufe, A. Bouhon, S. S. Borysov, A. V. Balatsky, Physical Review B 95:4 (2017): 041103. R. M. Geilhufe, S. S. Borysov, A. Bouhon, A. V. Balatsky, Scientific Reports 7:1 (2017): 7298. Even though many organic superconductors are known, the highest superconducting transition temperatures found so far are in the range of 10 Kelvin. A novel density of states similarity search tool developed for the OMDB will help future research to identify potential materials with similar electronic features to a well-known prototype. To stimulate the experimental verification of a recently reported organic high-temperature superconductor based on p-terphenyl, a similarity search for p-terphenyl has resulted in 15 novel candidates which potentially exhibit similar properties. A novel pattern matching tool for electronic band structures developed for the OMDB will stimulate future research identifying specific crossings in organic materials. Via a graphical interface users are able to draw patterns of band crossings which are used as a search query to find similar features within the electronic band structures stored in the OMDB. 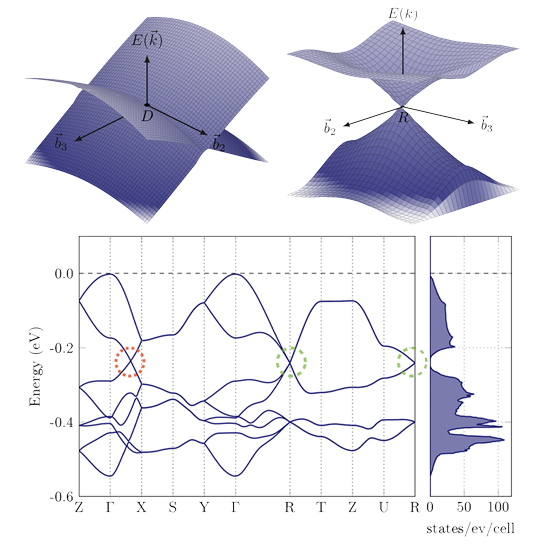 Excitations within materials hosting topological crossings can mimic condensed matter realizations of quasiparticles like Dirac or Weyl fermions (linear crossings), nearly free electrons (parabolic band touching), and more exotic particles such as hourglass fermions. The search tool facilitates finding real material realizations for any kind of point- and line-node material with various bands involved. S. S. Borysov, B. Olsthoorn, M. B. Gedik, R. M. Geilhufe, A. V. Balatsky, npj Computational Materials 4, 46 (2018). 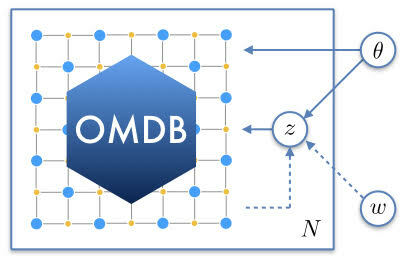 Be part of the OMDB community fostering data-driven organic materials design. The OMDB provides data-driven online services specifically for organic materials, a class of high technological relevance. The elasticity of these compounds connected to the endless configuration space and tuning opportunities open the path towards various basic research and industrial applications such as flexible electronics, carbon-sequestration materials and photovoltaics. We bring together scientists, publishers, and industrial partners of various background interacting via the OMDB. The OMDB community provides additional resources and services like computational support, experimental verification and synthesis. The social component of the OMDB enables the connection and stimulates the formation of virtual research groups fostering cross-institutional interactions world wide. 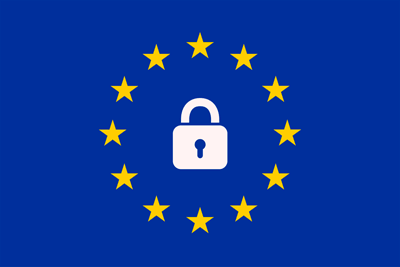 The EU General Data Protection Regulation (GDPR) harmonizes data privacy laws across Europe, to protect and empower all EU citizens data privacy. More info on eugdpr.org.